Cake Decorating: Basic Techniques & Beyond! 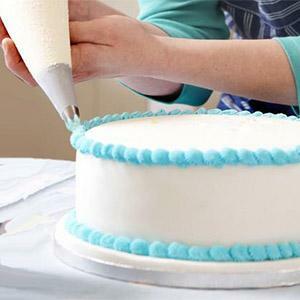 Today’s 3-hour interactive class, cake decorating expert Rachel Van Stratton, will take your basic decorating skills up a notch, as we explore intermediate techniques. After a quick review of the basics like the importance of “crumb-coating”, cooling, leveling, prepping, and more, you’ll tie on an apron and work next to Rachel and help her whip up a batch of Buttercream Icing and Royal Icing. Next, it’s all about the decorating as she shows you learn to make basic decorations such as stars, rosettes, and shell border, then move on to intermediate decorating skills that you’ll use to create beautiful flowers, succulents, and more. Sun 7/28/19 5:00 - 8:00 p.m.